I never quite got that line. But, you know, the song also says “bells will ring, ting a ling a ling” and “hearts will play, tippy tippy tay”, so maybe it’s more about rhyming than making sense. What I do get, though, is good pizza. For me, the best style is Neapolitan. Which means a thin base, cooked extremely quickly in an oven as hot as hell, so that the base is crisp and bubbling at the edges, floppy and sloppy in the middle. It’s covered in sweet, rich, quality tomatoes, just a bit of mozzarella, and not much else. That said, I don’t mind the odd inventive topping, even the occasional raised doughy base – just so long as those toppings are good and the bread is fresh and made on site. You’d think pizza is a fairly fail safe option, but there are many, many duds across London. Sadly, most of the omnipresent pizza chains are so big that they’re long past their sell by date. You’d be much better seeking out one of the following instead. 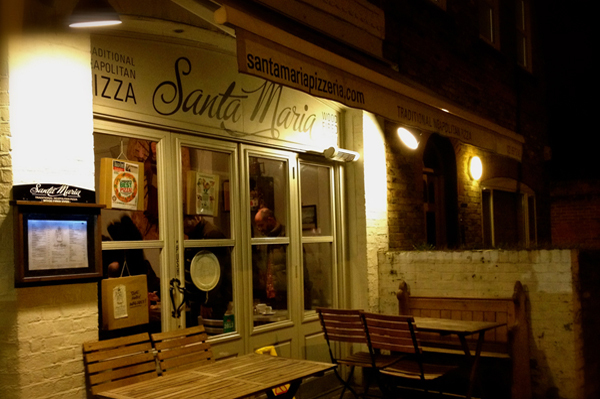 Santa Maria is in Ealing. Which is west and quite a trek from central London. 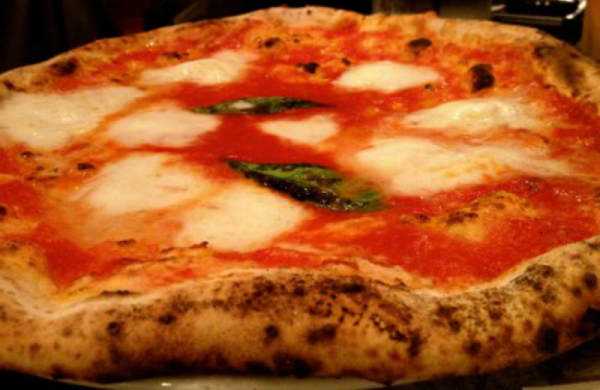 But it’s very much worth the effort and, in my view, the best pizza in the capital. The sourdough based pizza bases are always perfect, the toppings simple but stunning, and the overall effect as good as a pizza from old Napoli. It’s amore. They've a sister restaurant in north west London called Sacro Cuore. Here you go. One for the person who’s not bothered about Neapolitan authenticity and just wants an interesting topping, on a decent base, in a fun restaurant. Pizza East is run by the Soho House Group. It’s probably fairly summed up as being knowingly rustic yet also knowingly trendy. Service and setting are top quality. There are three sites at the moment – Portobello, Kentish Town and Shoreditch. It’s great for a group celebration. This is best central London option, I think. Pizza Pilgrims was started by two brothers who bought a tiny three wheeler (a green Piaggio Ape van) from Sicily and drove it back to Britain, via Napoli. They then put an oven in the back of it and started selling great pizza on the streets. Their restaurant is top value, extremely cheerful, and has no pretensions. It’s good for a social meal in Soho. The van still trades on the street and at festivals. P.S. I like their nduja pizza (pictured). Like Santa Maria and Pizza Pilgrims, Franco Manca is sourdough based, freshly made, rolled and blasted – and consistently excellent. They’re grounded in Neapolitan technique too – but don’t be surprised to find that the influence for toppings is more British than Italian. Gloucester old spot hams and cured meats, and Mozzarella made in Somerset. Franco Manca are rapidly expanding – find them as far East as Westfield in Stratford and West as Chiswick. The best though, remains the rough and ready original in Brixton. Santore, on the other hand, is not at all trendy. 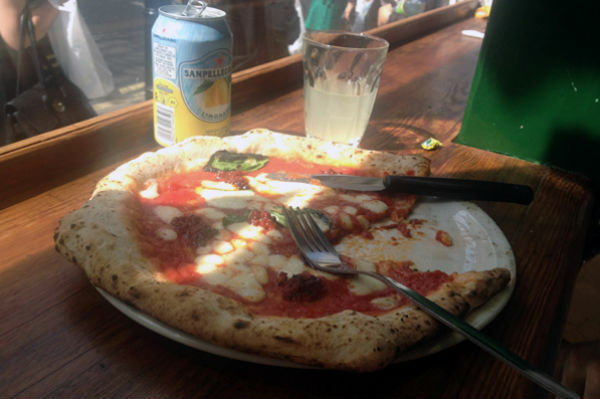 It has an enviable site on Exmouth market and bangs out decent pizzas and wine in comfortable surroundings. This one is for those who aren’t bothered by fashion or social media – you won’t find a website. Check out our deals for restaurants in London.